Bass and alto singers recording at the church, left to right, Michael Oliver, Jane Moore, Lawrence Blomfield, Sophie Clabaut and Sarah Garlinge. Five years after they were named best workplace singers in the country, P&O Ferries Choir will be launching their Christmas CD at a special event at Dover College in December. The album, called Winter Wonderland, is their second CD and follows the success of Ship To Shore which contained many of the popular songs that they performed at concerts throughout the area as well as at major musical events in other parts of this country and in France and America. They shot to fame on Gareth Malone's television contest The Choir: Sing While You Work in 2013 when they beat choirs from various companies and organisations from all over Britain. Since then they have sung with Susan Boyle, headlined at a classical open air concert at Leeds Castle, sung in London's Hyde Park as part of the Last Night of the Proms, at the Mission to Seafarers Christmas carol concert in central London which was attended by the Princess Royal, and taken part in concerts in Dover, Deal and Sandwich. They also organised summer concerts in Dover and Whitstable. 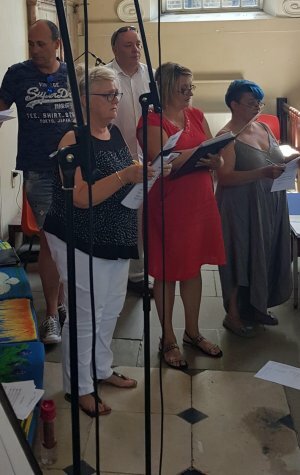 In the summer, they went to Church of the Ascension, Blackheath, where - despite the very hot weather outside - they recorded a range of Christmas songs for their new CD so that copies could be produced in time for the festive season. Tracks include classical pieces by Mozart and Bruckner as well as gospel, pop and folk songs. The launch takes place at 6pm on Sunday 9 December in the historic surroundings of the 12th century priory which is now the home of Dover College. At the launch, the choir will be singing some of the songs on the CD and the tickets, which are £15, include a glass of alcohol or a soft drink and a copy of the CD. Extra copies of the album will then be on sale at £10. Tickets, which are limited, can be booked at the box office on 07749 490964 or at www.ticketsource.co.uk/date/577328 where there is a booking fee.